Adidas Ultra Boost are neutral cushioned running shoes. The Adidas Ultra Boost is the last one from Boost™ family to reach the market. 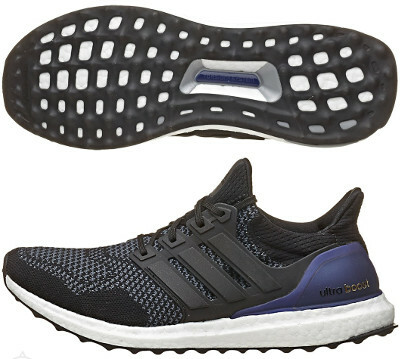 For neutral runners we already have racing (Adizero Adios Boost 2), performance (Adizero Boston Boost 5) and cushioned ones like the Energy Boost 2 and the Supernova Glide Boost 7, but Ultra Boost fills the gap in the premium segment plenty of cushioning and featuring superior materials. Main element in the Ultra Boost is the full length Boost™ midsole which guarentees outstanding responsiveness and rebound regardless weather conditions. This model contains at least 20% more Boost™ foam than any other running shoes manufactured by Adidas so far. Outsole has been completely redesigned to stretch with runner's foot strike and movement. Upper is made of lightweight, highly elastic Primeknit material for comfortable fit. It adapts to foot's natural expansion and reduce friction for smoother ride. Stability is based on external heel counter for natural Achilles movement and a TPU unit embedded in the midsole (Torsion® System) supporting the foot's natural rotation while running.